I am not, nor ever will be … an “Egg Drop” guy. Nope, I like mine SPICY! So this Vegan Hot and Sour Soup is absolutely PERFECT with just the right combination of heat and tang. 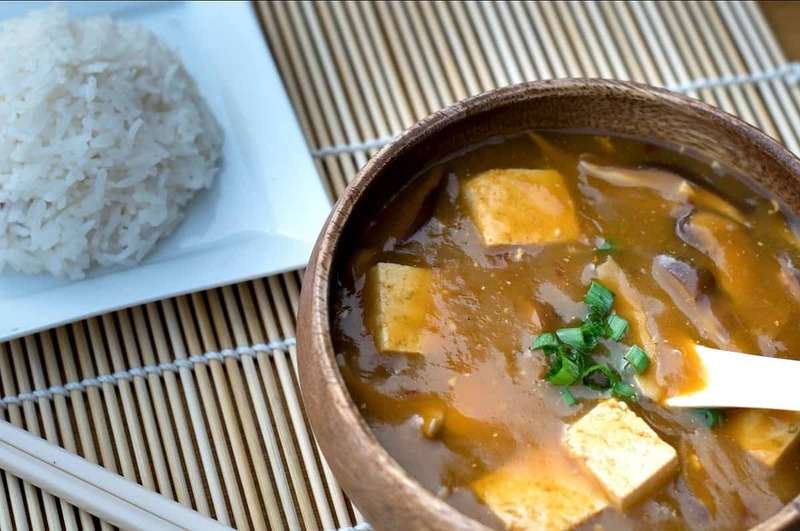 It only takes a handful of ingredients and maybe 30 minutes of your time to make this absolutely DIVINE Vegan Hot and Sour Soup. It’s thick and tangy, and you can totally adjust the heat to make it as spicy as you like. I use a jar of something called Chili Garlic Sauce for the heat in this soup. In my grocery store, it’s in the same section as the Jasmine Rice, Soy Sauce, and other Asian food items. I can’t pronounce the name (Huy Fong) – but look for the Rooster on the jar. I’ll include a link here so you can see what it looks like. This is an affiliate link and I will be compensated if you buy it. And ladies, just ½ tsp was perfect for my wife – and she does NOT do spicy. Serve this soup with some chopped green onions for garnish, and add a big bowl of sticky rice and you have a tasty and nutritious meal without any of the greasy mess of normal take-out. And if you REALLY want to go all out, make up a batch of my Vegan Orange Chicken too…..
Let’s go make some soup! Start with 8oz of Extra Firm Tofu. Drain all the water out of the package and then wrap the block of Tofu up in a few paper towels. Now cover it with something heavy (cutting board) and let it press all that moisture out for at least 5-10 minutes. Add 2 cups of Low Sodium Vegetable Broth and 1 cup of water to a large soup pot and bring it to a low boil. Toss in the mushrooms, the Tofu, 3 Tbs of Low Sodium Soy Sauce, and 1 Tbs of Hoisin Sauce. Give that a stir and let it simmer for 3-5 minutes. (New: You can also add 4oz or so of Bamboo Shoots too if you like, sliced into thin strips). Now stir in 3 Tbs of Rice vinegar (Apple Cider would work too), ½ tsp Chili Garlic Sauce (1 tsp if you like it spicy), and 1/8 tsp of White Pepper. Stir that up and let it keep simmering for another minute or two. Finally, make a slurry of 3 Tbs Water and 3 Tbs Cornstarch. Whisk until smooth and pour that into the soup. Stir to mix well and you should see it beginning to thicken immediately. Allow it to simmer until it has thickened to your liking, and serve. See? Wasn’t that easy? Who says cooking good food is hard?! I served this up with some freshly chopped Green Onions for garnish and a big bowl of sticky rice. (Oh wait! I forgot to mention those little Asian Spoons are like the cat’s meow for eating this soup! I had to go to a specialty Kitchen Store to find mine, but they are really great for this soup! I am not, nor ever will be ... an "Egg Drop" guy. Nope, I like mine SPICY! 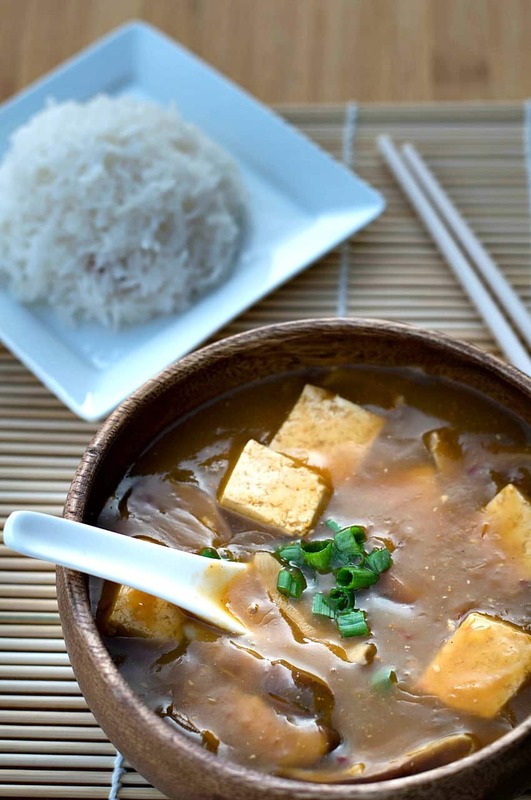 So this Vegan Hot and Sour Soup is absolutely PERFECT with just the right combination of heat and tang. Drain Tofu and wrap in towels. Cover with something heavy and allow to press for 5-10 minutes. Then cut into 3/4" cubes. Rinse and de-stem mushrooms, then slice into strips. Set aside. Bring 2 cups of Low Sodium Vegetable Broth and 1 cup of Water to a slow boil in a large soup pot. Add mushrooms, tofu, bamboo shoots, soy sauce, and hoisin. Stir to combine. Let simmer for 3-5 minutes. Stir in vinegar, chili sauce, and pepper. Continue simmering for 1-2 minutes. Whisk cornstarch and water together to make a slurry then stir into soup. It should begin to thicken immediately. Stir well and simmer until thickened. Garnish with freshly chopped Green Onions. Recipe originally published July 1, 2015. Yum! It looks great. This soup would be a great vehicle for adding more vegetables such as spinach and broccoli. 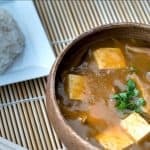 Can you suggest a substitute for the tofu? I can’t have soy. Add more veggies, add more mushrooms. Wow this was like one of the nicest meals I’ve eaten since going vegan! I had it with wholewheat pasta to make it more of an evening meal. Delicious! Wow! This was superb! Thanks Chuck! This was awesome! I made this along with your orange “chicken” which I served with sushi rice. My husband, who is not vegan but tries most things, raved about the soup and said the cauliflower was the best he had ever taken. Thank you so much for your wonderful recipes. Excellent! I cut the recipe in half because it’s just the two of us. I won’t next time! It’s delicious! I want more!!! Thanks Chuck! Hey Chuck, my love LOL Just kidding. I just made this and it is yummmy for my tummy I couldn’t find those mushroom so I used portabella. Also I added some water chestnuts for a nice crunch. It delish! Thank you for being so sharing of your talents. This is my favorite soup! Last night I was craving it ran to the store to grab the few things I didn’t have on the list. THANK YOU!!! It was perfection. I even skipped a few steps in the directions and literally just put everything into the pot. Took like 15 minutes for me. One of your failings is that you cater to Americans only. You often use American products in your recipes. The online community is much larger than the US and other people would like recipes using ingredients that they can make/obtain easily. When you use packaged foods, it lets us down. Easy solution: Go find recipes in your country then. Don’t mark down people’s recipes because of your personal problems. Chuck is very responsive and you could try asking for substitutes that may be recommended as other people online do. I love this soup. My favorite. I slice onions very thin and add for the look of bamboo shoots, Works great. This soup is so good! I am fighting off a nasty virus and craving Hot Sour Soup. This really hit the spot. I used about half the amount of cornstarch in order to have a thinner consistency and I forgot to slice the bamboo shoots – oops – which would haver made it easier to eat. I also used baby Bellas since the grocery didn’t have shiitakes. This is delicious; thanks for another winning recipe! Just made this. Definitely on point and super simple. I used a little less vinegar since I don’t like it too sour. This is my go to soup – we use portabella mushrooms and my mushroom-hating DH LOVES it! It’s become a weekly staple. Major kudos for getting the spicy just right – he adds a little extra heat, I like it exactly as written. Amazing, as always Chuck! Thank you!! Love your recipes! Loved the IDEA of your soup UNTIL you got to the adding THREE TABLESPOONS of cornstarch. THAT is the equivalent of adding NINE teaspoons of sugar to the recipe. As a diabetic, that puts this recipe out of reach, and the added cornstarch is the reason I can no longer eat even vegan Chinese food out. This problem is easily solved by substituting agar-agar, a seaweed, as the thickening agent. By the way, nearly everyone I know, myself included, had a very tough last week. Keep up the delicious experimenting! Here’s to easier times. Thanks for pointing that out – I have made this soup many times since and never used that much anymore. I think I only use 1 or 2 tsp of Arrowroot now. I’ll fix it.